This weeks challenge at Less is More is predominantly purple, purple is not a colour I use very often so I had to have quite a think about how I would use it. This is what I came up with. Tracy, this is great! I love purple, and I love those stamps you used. A+, my friend! Stunning card, its simply beautiful! So elegant and BEAUTIFUL! It is WONDERFUL in only purple shades -so stylish! Die Karte gefällt mir suupergut ! Purple seems to lend itself beautifully to colouring butterflies. Lovely card! Tracy, this is so very pretty. Love the butterflies. Simply stunning!! I love the floral border - it totally sets off that beautifully colored butterfly. And I am thrilled that I just picked up that set so I can CASE - thank you! Love this off centre design - just beautiful with those Hero Arts stamps! That is such a wonderful card! What a great use of purple! great choice of stamp Tracy! Thanks for commenting on my blog, the use of ribbon was just something different, nice to change it up every now and again. This is gorgeous! I love how you've placed your image along the left side of the card. Really pretty. :) Ann Y. This is gorgeous Tracy...I love your butterfly! Tracy, this is simply lovely! How beautiful this is! Fabulous card. 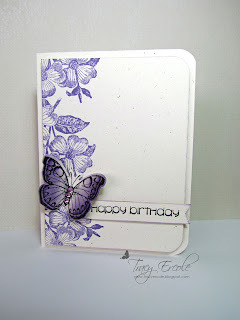 Beautiful card, Tracy, love the butterfly!!! Fabulous, like the way you have added the sentiment. I really like this card , VERY pretty !!! A beautiful card Tracy - the "off the edge" stamping is so effective, and what a gorgeous butterfly! Tracy, this is BEAUTIFUL!! LOVE your butterfly...your positioning with your vine and sentiment...perfect!!!!! Simple design = fabulous card. Really love the purple on this card. Time to dust off that set! Thanks for the inspiration.